The Delaware Ball is run by our Newark, Delaware class. It starts with a Grand March at 7:30 PM. Please see the NEWS page for details. Hogmanay is the largest event on the Delaware Valley Branch calendar. This celebration brings people from many branches together to dance in the new year. After the first half of the program a lavish midnight tea revives our energy to dance into the wee hours of the morning. Bring a ready to serve tea item, your dance shoes, and your energy! If you would like help finding a place to stay, please contact the Hospitality Coordinator. The Swarthmore College Folk Dance Club hosts this ball bringing the English and Scottish country dance communities together in one event. The Bryn Mawr Class hosts an afternoon tea dance for college and community dancers. Tea is provided by the class. 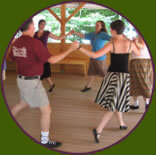 The Garden Party is a social dance followed by a potluck picnic supper. Weather permitting, the picnic will held in the home and garden of Geoffrey and Cecily Selling. Please bring ready-to-serve items. In case of inclement weather, we will eat at the dance location. The Delaware Valley Branch hosts two community ceilidh dances a year. Ceilidh (pronounced kay-lee) is a Gaelic word for a casual party with music and dancing and a variety of entertainment. The ceilidhs provide an opportunity for dancers from a variety of dance traditions to come together as well as people with no dance experience at all. Come and enjoy a variety of ceilidh dances, Scottish country dances, couple dances, and more! These events are suitable for inexperienced and experienced dancers of all ages. No partner needed. Just bring your dancing shoes (sneakers will do) and your enthusiasm. This ceilidh features a variety of entertainment. After a short Scottish country dance program, discover the various talents of your fellow dancers in acts silly and serious. The evening will include an auction of lost and found items and some group singing, ending with a marvelous tea. Our local musicians will be playing for the dancing and singing. Workshops are an opportunity to explore a specific theme or genre of Scottish dancing or music or to enjoy the talents of a guest teacher. © 2014. 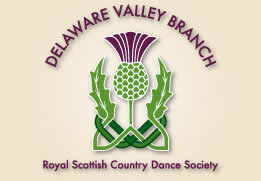 Royal Scottish Dance Society - Delaware Valley Branch. All Rights Reserved.